Taranaki Retreat organises and shares in fundraising, awareness-raising and community-building events throughout the year. Here, you'll find news of our latest; do check back regularly! A night out at The Good Home with a twist - you decide the price! 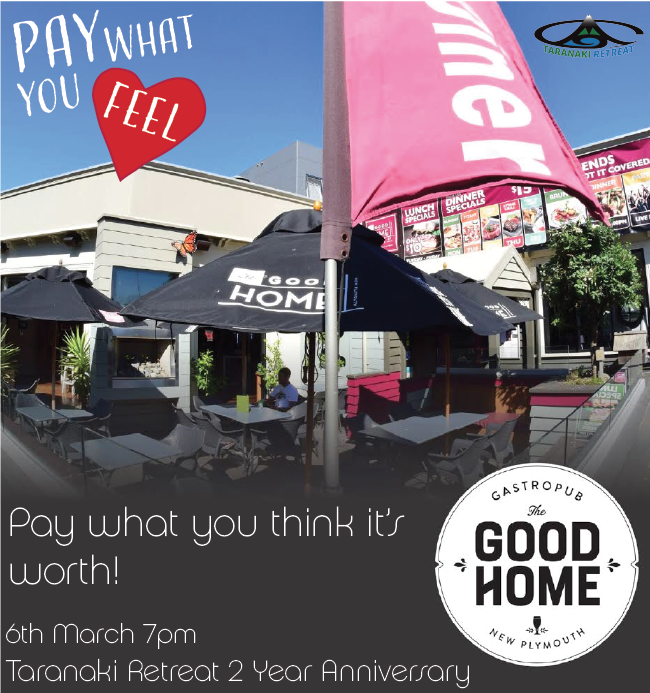 Enjoy a cheap (or expensive) meal while also celebrating the two year anniversary of Taranaki Retreat's opening with us! Pay What You Feel is not only a great opportunity to dine to your heart's content, it also commemorates two whole years of suicide prevention in our community, which is a pretty great thing to support. Is golf your passion? This event will allow you to play while also raising money for a great cause! Whether you've been golfing for years, or only months, this is a great way to help the Retreat from the comfort of the green. Contact Bill O' Dowd on 022 303 5430 or email gloria.odowd@gmail.com to register.